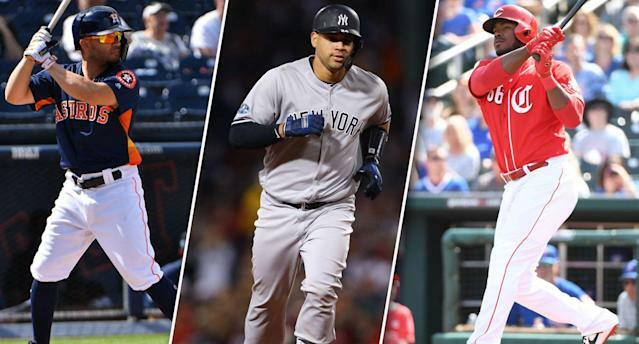 Fantasy baseball draft season is in full swing, and many people are trying to break ties with players they would or wouldn’t draft. Do you like Jose Altuve or Jose Ramirez? Are you in or out on Yasiel Puig in Cincinnati. Is Adalberto Mondesi overrated? How do you attack starting pitching as the game continues to evolve? Well, Dalton Del Don, Andy Behrens, and Scott Pianowski tackle all those questions and more as they discuss some of the hot-button issues facing fantasy players. Second base debate: Jose Altuve or Jose Ramirez? Second round — you’re on the clock — will it be Corey Kluber or Blake Snell? Will Yasiel Puig succeed or sputter in Cincinnati? Bryce Harper vs. Christian Yelich: Who ya got? Choosing a vet at third base: Justin Turner or Matt Carpenter? Is Vladimir Guerrero Jr. being over-drafted? Should you stash Eloy Jimenez or Victor Robles? Can you trust Adalberto Mondesi?